Nine community non-profit agencies received grants Tuesday, October 2, 2018, totaling $260,000 from Buhl Regional Health Foundation. The agencies will use the grants for mental and physical health or health-related programs in the Foundation’s service area. A brief meeting was held to distribute the grant awards and congratulate the agency leaders and grant writers who worked to request the funds for their organizations. The next grant cycle will open for Letter of Inquiry submission on Monday, December 10, 2018. Go to http://buhlregionalhealthfoundation.org/grant-portal/ for more information. 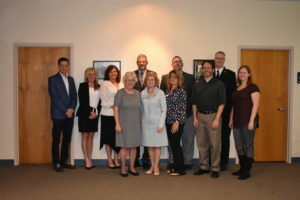 As Buhl Regional Health Foundation progresses its funding focus, it will continue to offer a capacity building environment to aid non-profit agencies in the service area in future collaborative grant requests. So far this year, the Foundation has offered a Grant Writing Class Series and an open invitation to participate in any of its five collaborative community health Action Teams: Transportation, Mental Health, Addiction, Food & Nutrition and Connecting Resources. Buhl Regional Health Foundation also recently announced the date for their 3rd Annual Fall Forum. This year the focus will be on the opioid crisis. The forum, Working Together to Battle Addiction, will be held Friday, November 2nd from 8:00 a.m. – 3:00 p.m. at Hope Center for Arts and Technology, Inc., 115 Anson Way, Sharon. The event is free and open to the public. Registration is required and can be made at https://brhf-forum-2018.eventbrite.com. The Buhl Regional Health Foundation is committed to improving the health and well-being of the neighbors we serve. We believe that through partnerships, education, and grant making, we can creatively impact the quality of life in our communities.